We’re thrilled to tell you that we’ve collaborated closely with the Messenger team as they have worked toward the launch of a product which facilitates communication between businesses and customers. Messenger announced today that they are launching the open beta of a website plugin called customer chat. Website visitors can use customer chat to talk with the merchant on Messenger without leaving the store. If the visitor leaves, the conversation continues on Messenger. It’s a win-win for customers and merchants. Customers no longer have to leave their email address to start a conversation, and merchants no longer need to wonder whether their responses will be seen by customers who left their website. You can add customer chat on your Shopify store in a few steps for free. Click "Add Customer Chat to my store"
Done! Customer chat is now live on your store. You can use Gorgias as a back-end tool to respond to conversations. Gorgias customers like Bodeaz and keto-mojo were among the first merchants to test Customer Chat. When choosing Messenger as their primary support channel, the challenge they encountered was to respond to requests fast enough. 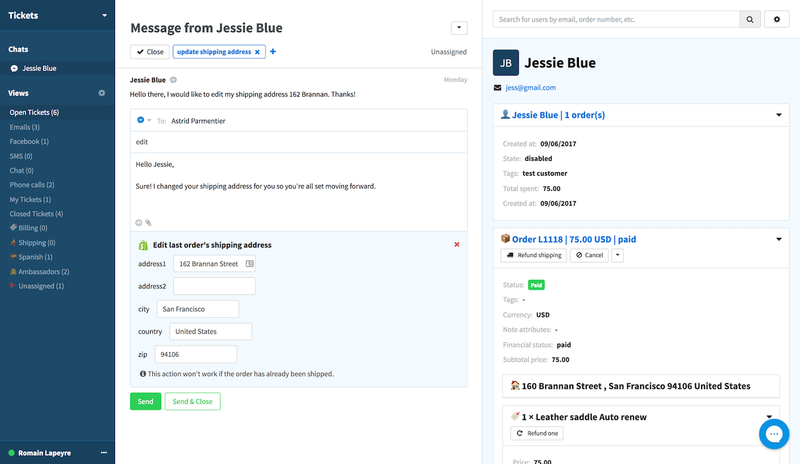 It quickly became hard to find the corresponding information in Shopify for a given Messenger user, like the order status or the shipping address. In the beginning, merchants had to ask the customer for an order number, or an email address, which added unnecessary steps to conversations. Resolution time was increasing. To overcome this issue, our team worked closely with merchants and Messenger to automatically match Messenger chats with customer profiles from Shopify in Gorgias. 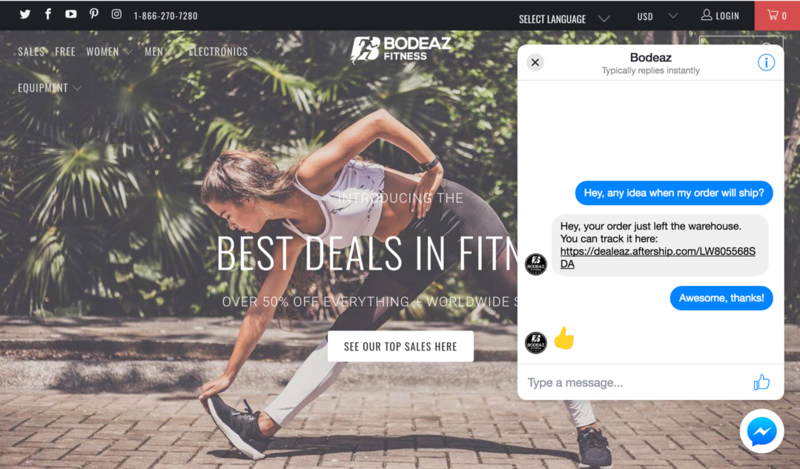 If the customer is logged in on the store when they initiate a Messenger conversation, Gorgias automatically associates the right Shopify customer next to the conversation. If not, it makes suggestions based on names or order numbers found in the conversation history. Now, agents see Shopify profiles next to Messenger conversations and can edit orders in one click. This way, support teams can maintain response time low. The average among our customers on Messenger is 24 minutes. Even better! Merchants can use Gorgias to automate responses to common questions. For instance, if a customer asks about their delivery status, you can fire an auto-response with the tracking number if the order has shipped, or if not, with the typical fulfillment delay. We’re excited to see e-commerce conversations moving to Messenger. It makes it more natural for customers to interact with brands. We’ll keep sharing our learnings as more of our customers decide to use Messenger as their number one support channel. If you're interested in trying Customer Chat out, create an account for free and add it to your Shopify store in one click! If you’d like to try Customer Chat with Gorgias, you can create an account here and reach out to support@gorgias.io. We’ll add it to your site within a few days, and your Messenger conversations will be matched with your customers in Shopify.